Although the weather in Dallas has been sort of a tease lately (cool and sunny one day, muggy and cloudy the next), summer will be here in the blink of an eye. With that in mind, I’ve been picking out some new items to add to my wardrobe for when the actual hot temps are here to stay. First I purchased a bunch of easy daytime dresses (this and this, for example) I could wear on weekends, traveling or casual get togethers throughout the week. More recently though, I’ve been investing in some super lightweight, easy breezy blouses to pair with jeans and shorts throughout summer. 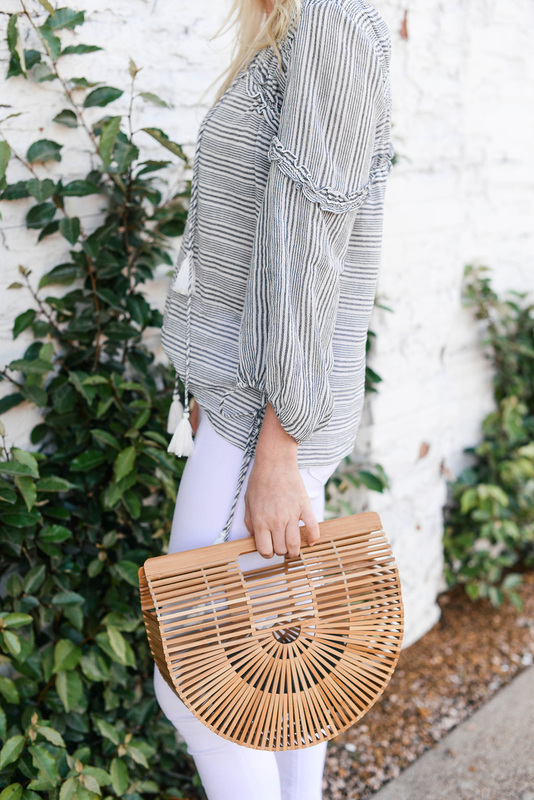 First you saw me in this Rails shirt in last Wednesday’s post, which is such a great laid-back item to throw on and go whenever! Today you’re seeing me in this more elevated look by 10 Crosby Derek Lam. It’s still casual enough for daytime wear, but the ruffle and drawstring details give it a nicer touch that can take you through to dinner and a night out. I love the boho, beachy vibes of the silhouette and the grey + white stripes allow for endless styling options. I’ll definitely be wearing this baby with shorts and skirts once the Texas heat prohibits jeans later this summer! 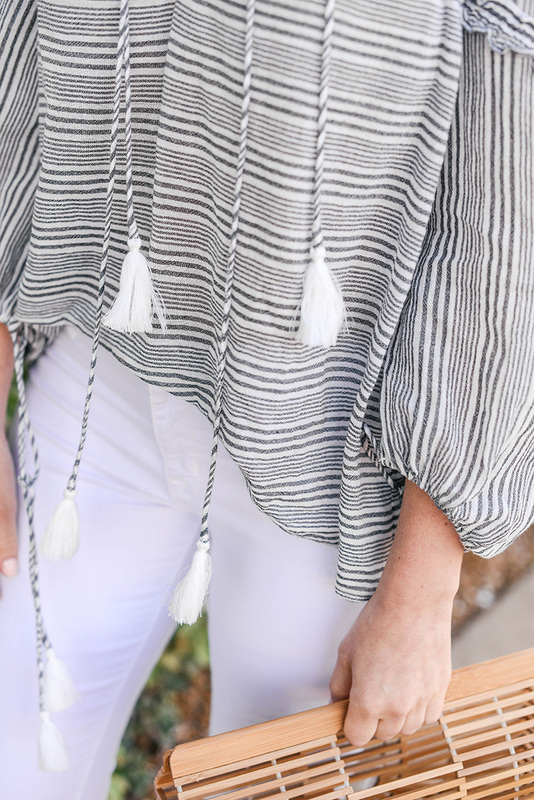 If you love the top I’m wearing but can’t fit it into your budget, try this similar style for under $50! This lightweight Free People top features an equally interesting silhouette with just a hint of shine. Perfect for date night paired with denim! This tropical print blouse is appropriate for work, but would look just as cute with white jeans or a colorful skirt on vacation! Joie always makes the BEST peasant tops! This blue embroidered style is the next on my list. Have a tunic obsession? Try this striped look from Alice + Olivia. So chic! 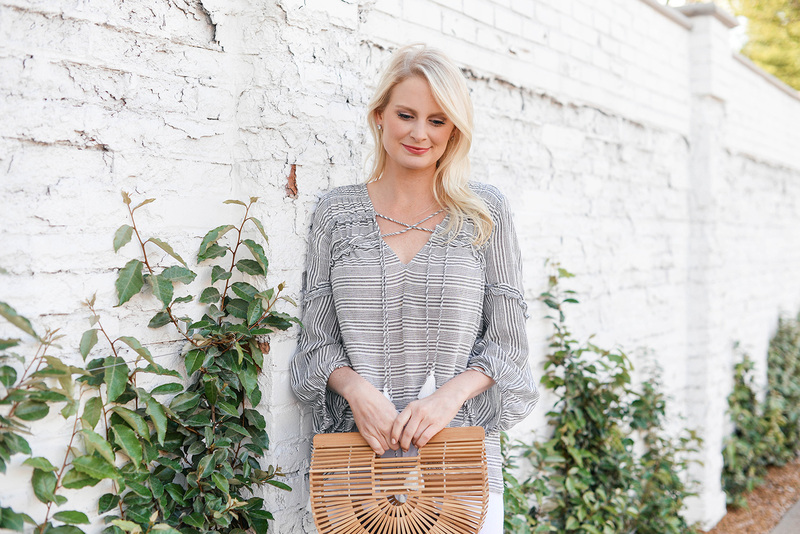 This eyelet blouse is on sale for under $70 and a total summer wardrobe essential. this blouse is adorable, love it paired with white jeans. How fun are those sparkled heels! Such a cute outfit! Oh i love that blouse – the style is so perfect for summer! That is the cutest top! 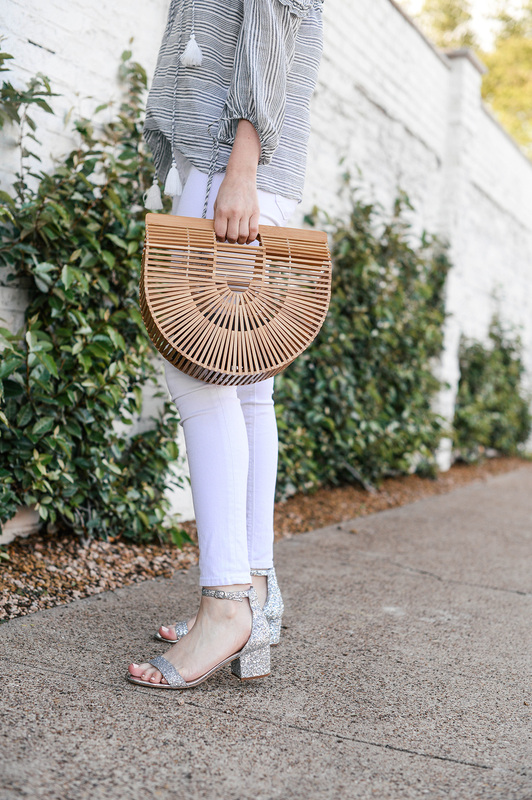 Love the entire look – especially that handbag! They are the exact same pair, but they are sold out in the silver glitter!